The Shavers Fork is the longest and most remote of the forks that feed West Virginia’s classic Cheat River and the highest large stream east of the Rocky Mountains. Multi-day trips on the Shavers Fork can range from a 32 mile trip that includes the best whitewater to a tour of the entire river canyon and the Cheat River below it stretching nearly 150 miles. Day trips on sections of the Shavers Fork require long shuttles on rough roads and so it is rare to find other boaters anywhere along the run, even among those who live in the vicinity. However, for those interested in a multi-day adventure, easy road access to the Shavers Fork at Cheat Bridge, Bowden, Stuart Recreation Area, and Parsons makes for simple shuttle logistics. From Cheat Bridge, the Shavers Fork builds from easy class I to class III in the first 20 miles or so. 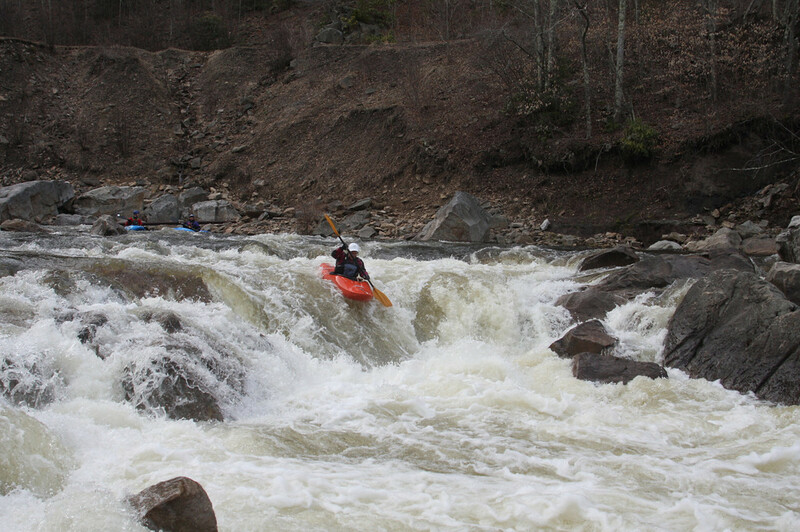 The river enters a narrow canyon about two miles upstream of a 15-foot waterfall called High Falls of the Cheat, and boaters will be thrilled by an 8 mile section of continuous technical class III/IV whitewater with three scout-worthy drops before arriving at the small village of Bemis. 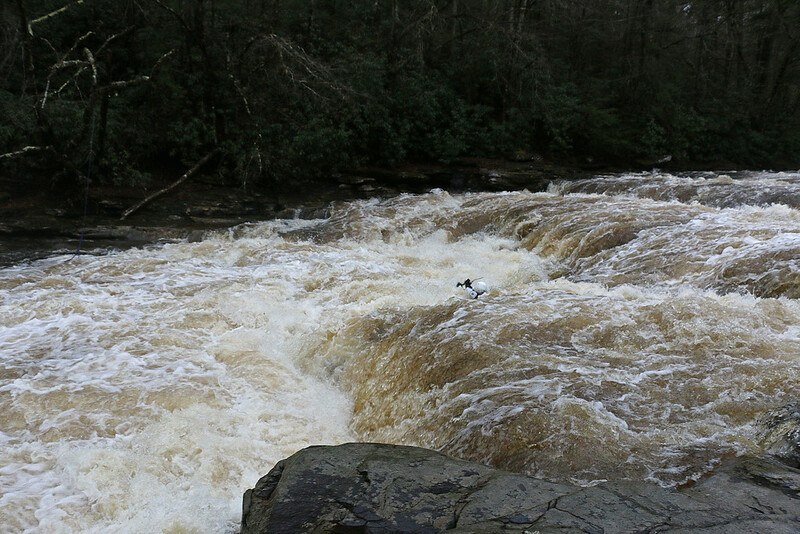 The whitewater continues for a few miles past Bemis and then the river gradually mellows over about 5 miles from class II to class I through to Stuart Recreation Area. Below Stuart, the river is generally flat for about 20 more miles with intermittent class II waves all the way to Parsons, where it joins the Black Fork to form the Cheat River. Shavers Fork of the Cheat, West Virginia. Photo by Art Barket. You can extend your trip onto the Cheat River but it involves a considerable amount of flatwater on the Cheat River Water Trail (http://cheatriverwatertrail.org/) before Rowlesburg in order to get to the well-known Narrows (II/III) and Canyon (III/IV) sections. The Narrows is roadside with no real camping options, but stick it out to the canyon for superb sandy beach camping. Below the typical Cheat River take out at Jenkinsburg are a few miles of big water class III whitewater followed by a one hour paddle by kayak across the Cheat Lake backflow to public access and parking at the Ices Ferry bridge. A USFS sign on the Shavers Fork. Photo Art Barket. 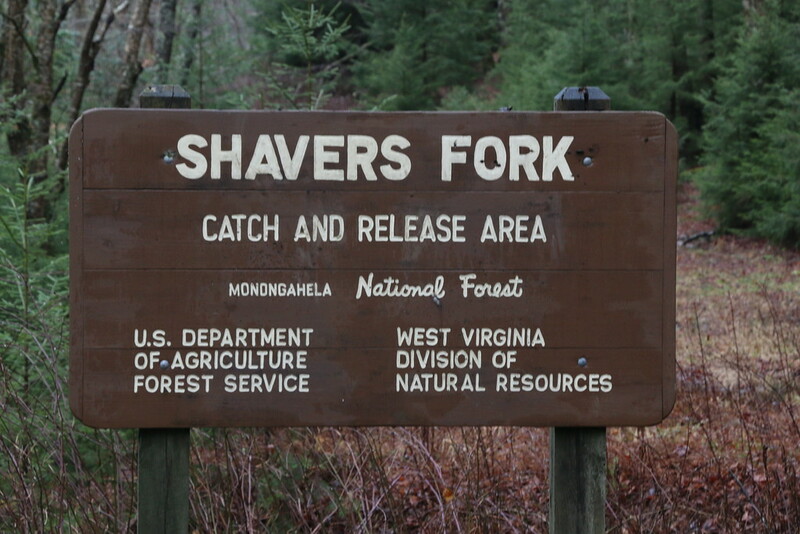 Much of the Shavers Fork is in Monongahela National Forest, which is managed by the US Forest Service (https://www.fs.usda.gov/mnf). No permits are required for river users, just jump on in and leave no trace. Sidestreams on the Shavers Fork. Photo Art Barket. There are many options for a multi-day trip on the Shavers Fork. The following sections and rough mileage should help facilitate a trip as short as two days. Road access to Bemis is very long (though paved) but all other access points are along primary roads. The best overnighters on the Shavers Fork begin in the vicinity of Cheat Bridge. There is free, legal parking at the bridge itself (FS 250/4) where the Cheat Salamander tourist train has a small shelter and lot. A more secure option is about a mile upstream of Cheat Bridge at the luxurious Cheat Mountain Club on FS 236, and a gracious call to them may get you a protected parking spot and a very easy launch site. I’ve asked once, and was granted permission (304-456-4627). Or, for added mileage and the option of a campsite at the put-in, drive upstream along FS 233 and find just the right spot. There are many of them. The first reasonable take-out is at Bowden, on river right by the Faulkner Rd. bridge just below the US 33 bridge. Parking is available there. But better than that, a few miles below Bowden is Stuart Recreation Area, a WV State Park that includes a campground, great picnic areas including New Deal era pavilions, very good river access, and parking. Below Stuart there are only a few harder-to-reach access options before Parsons. In Parsons, there is a Cheat River Water Trail parking lot and a well maintained take-out area on river left at the US 119 bridge. Taking out there and not walking a block to Little Andi’s restaurant to feast on rampburgers would be regrettable. 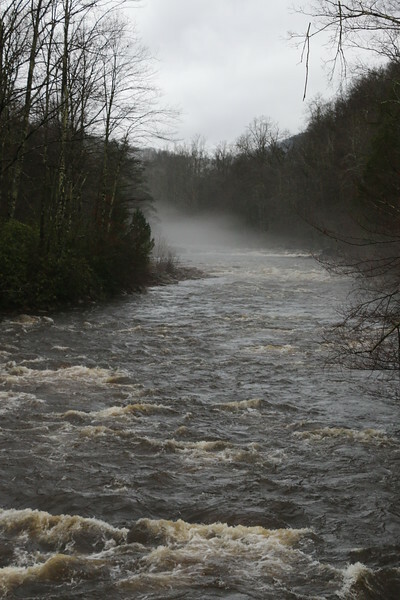 Foggy West Virginia whitewater. Photo by Art Barket. 600 cfs at Cheat Bridge is a good minimum flow for a relatively stress-free trip on the Shavers Fork. 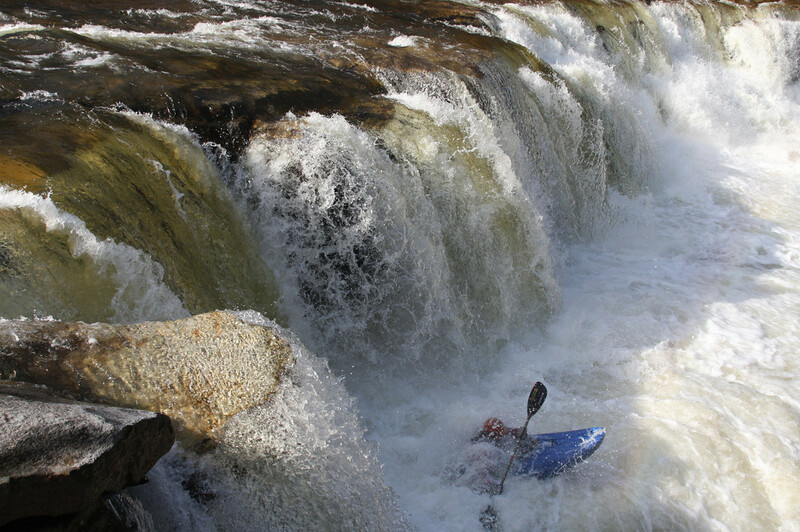 Above 1000 cfs the river becomes pushy and arguably unreasonable for long boats stuffed with gear, especially for the sections below High Falls. Matt Pascal and Brian Joly below High Falls. Photo Beau Smith. Between Cheat Bridge and Bemis, the Shavers Fork passes through the Monongahela National Forest and users can camp anywhere along the bank. Established sites are easy to find (primarily at confluences with tributaries and on river left where angler access roads terminate at the bank). There is a lot of good camping at High Falls of the Cheat, where the tourist railroad has built an observation deck on river right. There is also a three-walled train shelter in good shape that is used by backpackers with some questionable legality accompanied with negligible risk. Below Bemis, the river corridor passes through private land with very few homes or cabins. There are campgrounds at Bowden and Stuart Recreation Area, and below that camping can be found with landowner permission. River islands always provide a legal camping option without permission. Another shot from High Falls on the Shavers Fork. Photo Art Barket. The seclusion and aesthetics of the Shavers Fork are unparalleled in the region. Paddling the best part of the stream, from Cheat Bridge to Parsons, could be done in two long days in kayaks. However, to really enjoy the Shavers Fork, consider a more relaxed and enjoyable option with campsite stops at High Falls, Bemis, and Stuart Recreation Area. 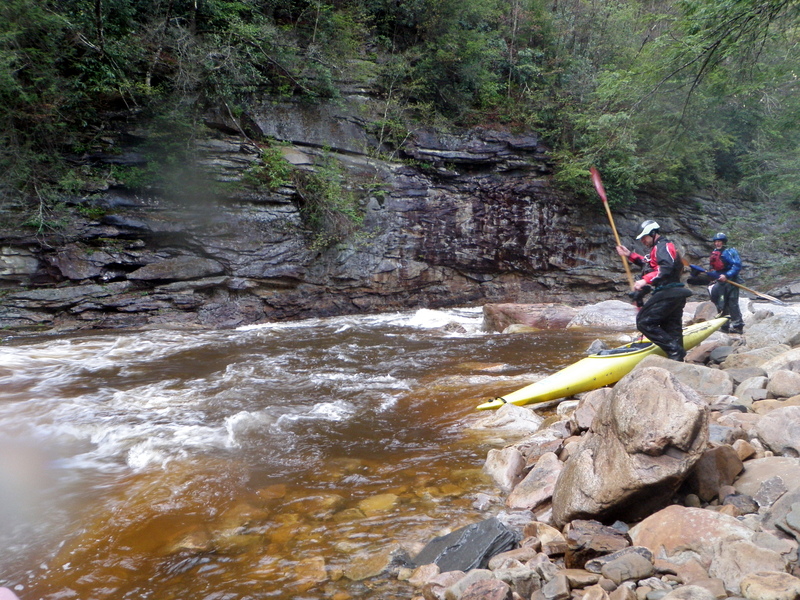 The rapids of the upper Shavers provide a gentle crescendo into the whitewater section from the launch at Cheat Bridge. Launch, look around, and relax as the road disappears behind you and the wilderness takes over. Although the railroad follows the river nearly the entire way to Parsons, it is only used in the summer and even then, intermittently. The best whitewater begins with an uptick in gradient over a few ledges and slides along the wide-open river about 15 miles in. Before long a rapid on a right turn in the river at a rocky gorged-out spot announces that it’s time to buckle up and get ready. (NOTE: this YouTube video begins at this point). High Falls is approaching. Within the next mile, watch for the horizon and observation deck on river right. Everything you need – the best view for scouting, a portage trail, campsites, ideal positioning for photos of falls runners, and even a shelter should you need it – is on river right. Below the falls, continuous class IV is the norm until the second railroad bridge; there’s an unnatural and ugly hole under the bridge that can be run, though a sneak on the far river right is sometimes available. Not too much further below that are the Bemis Ledges (aka, Mule Hole), a 1-2-3 punch of riverwide holes over about 50 feet of river. Bill Warble deep in a seam on the Shavers Fork in West Virginia. Photo Art Barket. 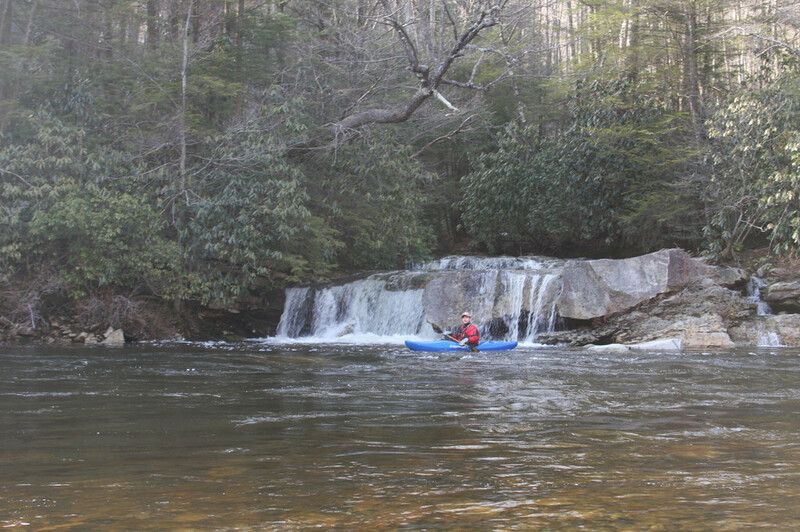 For those familiar with the classic whitewater of the area, the technical section of the Shavers Fork runs similar to Big Sandy Creek or the Upper Yough. Below the ledges, the whitewater continues for a few miles as you pass under bridges at Bemis followed by a decrease in technicality and by the time you’ve reached Bowden at US 33, the river is flat and gentle again. From Stuart Recreation Area, the river is mild for decked boats, but at higher water canoes would swamp without flotation. Stewart Caldwell has paddled from the source of the Shavers Fork (Shavers Lake at Snowshoe Ski Resort) to Cheat Lake, probably approaching 200 miles, and Jim Snyder has done the 140 mile trip from Cheat Bridge to Cheat lake in an inexplicable 48 hours. This article was contributed to CampingByKayak.com by Matt Pascal, with special thanks to Stewart Caldwell. Photos contributed by Art Barket.